Day 263 Sospel, Alpes Maritime, France to Lake Maggiori, Italy. This morning, we were awoken by the revving of motorbikes, as they all headed off up ‘Le Route Des Grandes Alpes’. We stood chatting with the pleasant lady who ran the campsite. The told us that the route was very popular with bikers and vintage car drivers, since this route is part of the Monte Carlo rally. She also asked us a ‘special favour’. The campsite was literally closing this morning, so we were her last customers for the year. She asked if she could video us driving off, so that she could put it on Instagram and Facebook. We happily agreed – Oscar would be a star! Just as we were about to leave, Howard asked me if I had seen his glasses. He then remembered where he had left them – on the ledge of the pop up, when he went to bed. Consequently, he raised the roof a little to retrieve them, and then put the roof back down, or so he thought. In our haste to leave, as the owner stood armed with her phone, ready to film us, the van made an odd beeping noise. No matter, we thought – the lady is waiting. So we proudly drover past her, waving happily out of the window. But as we turned the corner out of the campsite, the odd beeping noise started up again. I suddenly realised hat it was – Howard hadn’t put the roof down properly. I was mortified! 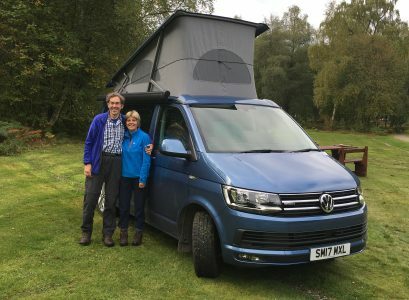 Our first chance at camper van fame, and we had driven off, being filmed, with the roof half up! What wallies!! Red faced, we drove back down into Sospel, and couldn’t resist a last coffee in our charming little cafe. It really is the most charming town, surrounded by stunning scenery, and barely a visitor in sight, just lots of chattering locals. Just brilliant. The morning then got even better. Our drive northwards was an utter feast for the eyes. I cannot put into words just how beautiful this drive was, through a piece of France that we are both unfamiliar with. It was totally unexpected. We struggled to know which way to look, as we twisted our way up through the mountains, with 360 degree views. Utterly stunning! Once we had climbed up high, and then down again, we came to a spectacular gorge, carving through the rocks. We came to the ancient town of Tende, in the Mercanteur National Park, close to the border with Italy. Around the town are more than 20 summits, all exceeding 2,000 metres. It was just wow, wow, wow all the way! We came to the Col de Tende, a strategic route through the Alps to Piedmont, used in medieval times to transport salt between France and Italy. We then drove through the single lane 3km tunnel, controlled by traffic lights, into Italy. At some point in the tunnel, our satnav told us we had crossed the border. This is our third foray into Italy on this trip, but we had only ventured this way in order to cut off a corner into Switzerland. The alternative route, through France, along the Grande Route des Alps would have meant a twelve hour hair raising drive, which we reluctantly decided against. Once back in Italy, the scenery rapidly changed from breath-taking mountains, to a very flat plain, winding it’s way past Cuneo and Turin. We took the autoroute towards Switzerland, and the drive became dull and tedious, the only excitement being trying to understand the automatic toll machine, which refused to speak to me in anything other than Italian. Eventually, an Italian lady came over on the intercom, who likewise, could only speak Italian, so no more helpful. In the end, I just stuck Howard’s credit card in, and it charged us a whopping 30 euros. I’m still thinking we were overcharged, but no way of checking, since it offered me no receipt either. A stark contrast from Greece, where they don’t put up the barrier up until you have taken your receipt – no doubt part of their anti-corruption measures. Eventually, we tired of driving, and opted to stop at an Italian campsite on the shores of Lake Maggiore, just short of the Swiss border. I suspect that we may well be the only ones on this site tonight – everything seems to be closing down for the winter! But, as the name suggests, it is indeed very tranquil here, with a distant view of the lake. Somewhere though, between France and Italy, we have lost the sunshine, and there is a definite chill in the air. I think we have just waved goodbye to summer. Previous Post Day 262 Bastia, Corsica to Sospel, Alpes Maritime, France. Next Post Day 264 Lake Maggiori, Italy to Malbun, Liechtenstein.